July weekend is packed with fire hazards, from fireworks to grills to bonfires. In 2013, over 11,000 Americans were hospitalized for firework-related injuries. 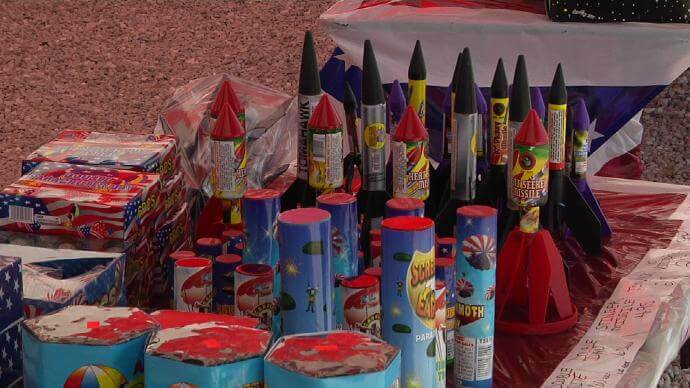 The Battlefield Fire Protection District says they respond to many calls for accidents caused by fireworks, mostly to the hands, eyes or face. If you are lighting fireworks, be sure to have a bucket of water nearby and let them soak in that bucket before throwing them away. Don’t hold a firework in your hands and don’t look down the tube to see if it’s lit, just step away and keep a safe distance. Roman candles and sparklers are some of the most dangerous items that often cause accidents. Sparklers are popular choices for the kids, but they can very easily cause severe burns. When it comes to fireworks, also be sure to check your city’s ordinances. Police departments can and will issue citations if you are setting off fireworks on a day or during a time when they are prohibited. Fireworks are prohibited within the city limits of Springfield and Rogersville. In Nixa, fireworks are only allowed on the Fourth of July, which is Monday, from 2 pm to 11 pm. In Battlefield, fireworks can be set off today through July 6th from 10 am to 10 pm. On the Fourth of July holiday itself, they can be set off until midnight. In Willard, fireworks are permitted from noon on the Fourth of July through 12:30 am on the July 5. And in Ozark, fireworks can be set off from 9 am to 10 pm today and tomorrow and from 9 am to midnight on July 4 and 5. Still, even where fireworks are allowed, Deputy Chief Reynolds suggests leaving fireworks to the professionals. That is the best way to ensure your family’s safety over the holiday weekend. Fireworks aren’t the only fire hazard over the Fourth of July. July is the peak month for grilling fires, and most of those begin on a balcony, patio or porch. Reynolds says Battlefield Fire sees a lot of flash burns and first degree burns from people using grills incorrectly. If you’re using a gas grill, keep the lid open when you light it. And if you use charcoal, put the charcoal in a metal can with some water before disposing of it. Also be sure that any grill is more than 10 feet from your house, and never use them on apartment balconies. For bonfires or campfires, use natural materials to start them, never use flammable liquids. Most of all, be aware of your surroundings. Put someone in charge who won’t be distracted by any festivities and can keep an eye on any fire hazards. “Any time that you have a large gathering of people and there’s some alcohol involved, there are going to be some decisions that are made, or safety measures that are overlooked, so it’s always good to have, like I said, with the fireworks or when you’re grilling or those kind of things, make sure you have a competent adult, somebody that is paying attention to those things, that is situationally aware of their surroundings,” Deputy Chief Reynolds said. Reynolds added that one other safety issue that people often don’t think about is traffic accidents over the holiday weekend. A lot of people will be distracted while driving, looking at fireworks displays. There will also be a lot of kids out and about past dark, so pay attention when driving this weekend.